How do I find my best or worst performing Pinterest Boards? Use Tailwind's Board Insights report to easily see which boards are working best for your brand. If you’re trying to figure out which of your Boards are performing best (or worst), you’ll want to check out the Board Insights report. The Plus plan includes the last 7 days, but if you have Lite, Professional or Enterprise Plans, you’ll be able to change the default date range to see how your Boards performed historically as well as export. 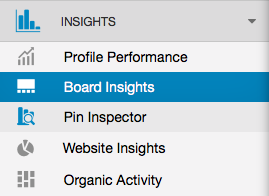 Go to the Board Insights page (located in the pop-out menu in the left hand navigation). 2. Click the column title for Board to filter for Alpha order, and any of the other columns either by Total or by Last 7 Days for highest total. You can also sort by either highest Virality Score or Engagement Score. Helpful Tip: Learn more about these scores from our Knowledge Base Article, "What Does Virality Score, Engagement Score, and Engagement Rate Mean?" 3. Click the title again on any column to Reverse Sort and see the lowest totals. 4. Filter the selected boards to include (or not include) Group, Secret, and Regular boards as well as change which engagement metric you want data for. The default is Repins, but if you wanted to see the highest or lowest Comments, you'd click "Comments" instead. Finally, one important note on Group Boards. For Group Board data here, the engagement metrics (Repins or Comments) represent the total sum for all Tailwind members who are part of that Group Board, and do not necessarily represent engagement on only your own Pins on that Board. This means that your Virality Scores and Engagement Scores could possibly be inflated for Group Boards as well due to this.